Editor's Note: In the United Kingdom there is open and significant debate about whether to build a replacement fleet of Trident ballistic missile submarines to replace their current fleet of four Tridents. Interestingly enough, the British Tridents carry U.S. designed and built Trident II D-5 missiles just as the 14 Trident subs in the U.S. fleet. What is noteworthy is that there is absolutely NO public debate about whether we should build the 12 Trident replacements currently in research and development by the U.S. Navy. The only "debate", and it is not much of a debate, is how to fund the massive, budget-busting $100 construction price tag!!! Trident is a bad idea, no matter on which side of The Pond one resides (or for the rest of the world for that matter). It is a Cold War relic, a first-strike tool of mass destruction beyond anyone's worst imagination. Should just one of those subs unleash just one missile (with it's multiple thermonuclear-armed warheads) it would mean instant death for upwards of a hundreds of thousands to a million (or possibly more) people in a large city. 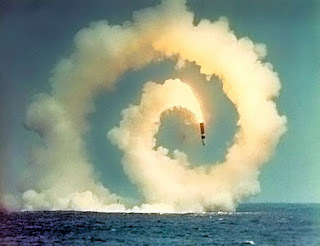 Of course, that is not how it will likely work should Trident actually be used. Even a limited nuclear war between the U.S. and Russia, still a possible scenario) would mean the end of civilization as we know it; a humanitarian disaster incomparable in human history. 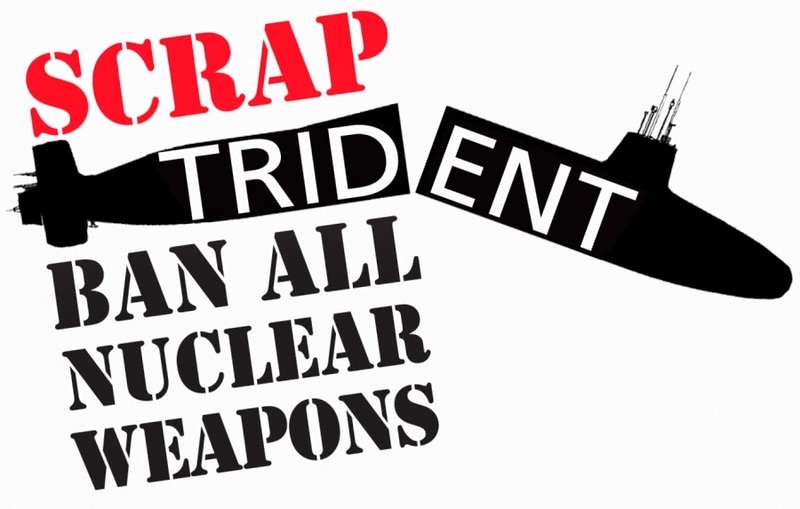 As debate intensifies about the future of Britain's nuclear weapons, it's worth remembering that Trident isn't just an increasingly unpopular, expensive status symbol - it is also a weapon of mass destruction. Britain's own stockpile could kill hundreds of millions of people and current global nuclear weapons stocks have the capacity to destroy human civilization and the environment many times over. 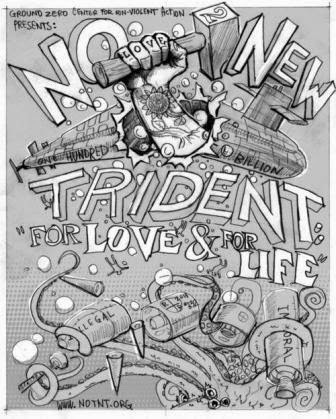 We who resist Trident here in the U.S., and work to prevent a new generation of Trident, support our colleagues in the UK as they push for "Bairnes [children] Not Bombs!" This struggle is a global one, and we can only hope that (as the Non-Proliferation Treaty Review Conference continues at the UN) the voice of the people will drown out the voices of the nuclear weapons status quo. The world can ill afford it. 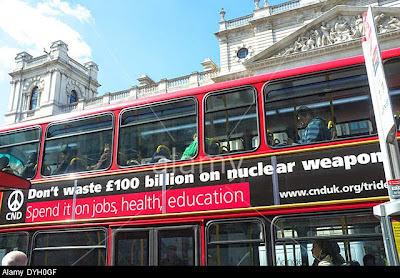 Dr. Kate Hudson, who wrote the following article, is General Secretary of the UK-based Campaign for Nuclear Disarmament (CND). Yet this truth does not really figure in the current debates over Trident in the way that it has in the past. It seems as if we know it in the abstract, but the knowledge of that no longer holds the same terror, the same imminent sense of destruction beyond our control, that it held in decades gone by. Perhaps the reality of modern day warfare and our extensive exposure to it via our screen-dominated culture has inured us to the potential horrors of nuclear use, whether by accident or design. Scenes from Fallujah or Gaza are far more immediate than the risk of nuclear Armageddon. As deaths through small arms reach exponential proportions, discussion of nuclear bomb deaths from seventy years ago seem like ancient history to the younger generation. And when it comes to end-of-history scenarios, climate change with its tsunamis and extreme weather events, or risk of mass starvation, global pandemics or mass population movements, seem much more powerful, indeed already present. A message you don't see on buses in the U.S.
Our vision of the apocalypse, simultaneously terrifying and compelling, has shifted to these seemingly more contemporary threats which have certainly taken over the fear factor in popular culture - as I'll be discussing in a session on 'Visions of Apocalypse' at HowTheLightGetsIn festival in May. And these threats have displaced earlier preoccupations with the impact of atomic science, whether through weapons use or experimentation, through blast, radiation or mutation. During the Cold War, fear of the bomb and fear of the unknown impact of scientific experimentation took hold on people's imaginations. Then as now, film was a mirror of society's anxieties, and Hollywood paved the way with the developing science fiction genre. Them!, directed by Gordon Douglas in 1954 featured giant radioactive ants on the rampage, the result of an atomic test in New Mexico. Stanley Kramer's On the Beach, a 1959 film adaptation of the novel by Neville Shute, was set after a nuclear apocalypse as a group of people await death from radiation. This film affected audiences strongly and a subsequent generation was equally affected by Threads and When the Wind Blows. No doubt, if viewed today, they would not have the same impact. Yet the same reality would ensue, if nuclear weapons were used. Radioactive fallout would render parts, if not all, of the planet uninhabitable. There would be no place to run to, no place to hide; in the event of a nuclear war, you may escape the blast but you cannot shut the door on radiation. It will poison and destroy, bringing sickness, cancers, birth deformities and death. No one is exempt. That is what makes nuclear weapons uniquely terrible, and a foretaste of that is already with us, not only through the experience of Hiroshima and Nagasaki, and the catastrophic health and environmental impacts of nuclear weapons testing, but also through the fallout from nuclear power disasters at Chernobyl, Fukushima and elsewhere. When we debate Trident's future, we would do well to recognise that although we no longer live in direct fear of nuclear weapons, as the older ones of us may remember from the Cold War, the risk and threat still remain as powerful as ever. The nuclear danger has not dissipated, the weapons are still there, and unless they are dispensed with, we may all yet disappear into a mushroom cloud of our worst imagining. Kate will be speaking at HowTheLightGetsIn, the world's largest philosophy and music festival, running from 21st May - 31st May in association with The Huffington Post UK.